by Seton Motley, Contributing Author: What is far and away the most important global trade commodity? Food. People have to eat. Before the world’s peoples can afford to purchase from us an iPhone, or a Ford pickup truck - they have to buy (hopefully our) food. And governments are making sustenance so much more expensive. Governments raise the prices of everything we try to buy. 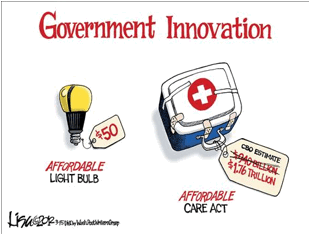 They do so indirectly - via hidden costs of government we can’t clearly see. Just here in the United States:America's Soaring Regulations Cost $1.8 Trillion A YearThat $1.8 trillion is added to the cost of everything we make - including everything we try to sell to the rest of the planet. Much of that government cost-increase is in the food sector. Farm Bill, anyone? 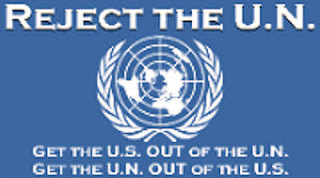 Making it harder for peoples around the world - many of them in abject poverty - to afford food. Governments don’t just sneak up on us - they go after us directly. And tax and tariff what’s left of the daylight out of everything. 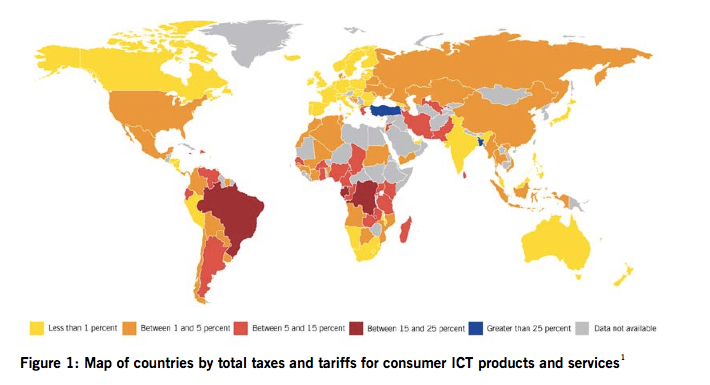 The Information Technology and Innovation Foundation (ITIF) just did this:Digital Drag: Ranking 125 Nations on Taxes and Tariffs on ICT Goods and ServicesICT stands for “information and communications technology” - how the world taxes iPhones, laptops and Internet service. Shocker - many of the governments are exceedingly greedy. What do these government impositions do to their peoples?The scholarly economic evidence is clear that higher taxes and tariffs on ICT goods and services reduce adoption.“Adoption” means: whether or not they buy tech stuff. More government means they buy less stuff. Including food. More government - regulations and taxes - means higher food prices. And the global food sector is loaded up with way too much government. For instance, Americans for Limited Government (ALG) just did this:Getting Rid of Sugar Subsidies: A Look to the Future After Decades of FailureWhich broadly examines the Crony Socialist nightmare mess that is this global market sector.India is the second largest sugar producer in the world behind only Brazil. In spite of a five year glut on the worldwide sugar market, India’s government increased supports for sugar exports with a goal of increasing them from 1.3 million tons in 2013 to an average of 2 million tons in 2014 and 15…. Thailand is the second largest exporter of sugar in the world, and their new military government has plans to immediately and dramatically expand production by opening up new state-owned land for sugar production and encouraging some rice producers to change crops…. Twenty percent of the Mexican sugar industry is owned by the Mexican government creating the ultimate government subsidy – immunity from needing to produce a profit. To assist the rest of their domestic sugar industry, the government provides subsidies for them to export sugar and government loans with debt forgiveness features built into them.And round and round we go. This is a regulatory arms race - governments meeting governments tax for tax, subsidy for subsidy. Which raises the price of food for everyone. If you want to put a real dent in global hunger - put governments on a diet. Tags: affordable food, accessible food, food, Seton Motley, Less Government To share or post to your site, click on "Post Link". Please mention / link to the ARRA News Service. and "Like" Facebook Page - Thanks!